I am currently a student at the University of Wisconsin - La Crosse. I am taking classes to prepare myself for medical school. My background is in business rather than life sciences, so the class that I created this site for, Organismal Biology, is really unique for me. I have obviously seen many species of organisms in my life, but have never really seen all the interconnections between all of them. I have been surprised by the fact that all of the plants and animals that I am familiar with contribute very little to the vast number of organisms that collectively make up the great biodiversity of life here on our planet. I grew up in the Twin Cities area of Minnesota and for the most part I have lived in the Midwest my entire life. Why am I interested in Red Wigglers? I have never really been one to jump on the band wagon to “Save the Whales,” “Save the Planet,” or “Go Green.” But, one day as I was making eggs for breakfast held onto the cracked shells of those eggs and thought to myself, “I should really compost these egg shells.” I quickly consulted “Uncle Google” and found out a bit about composting. It looked pretty boring and it was almost winter time so I thought maybe this wasn’t going to be worth it. Then, I stumbled upon vericomposting and thought “Cool!” Maybe an hour or two later I had ordered a thousand worms online and in a couple of days ­I was vericomposting! I never would have imagined it, but now I am really conscientious about recycling and what goes in the waste basket at my home as well. I don’t know why I started doing it, but I enjoy it now and it feels good knowing that I am helping the environment in my own miniscule way. 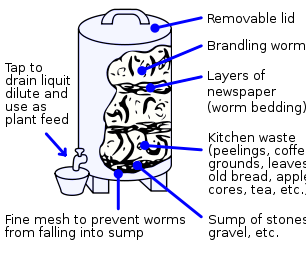 I hope you enjoy this site and maybe consider making your own worm composting bin for your home. If you have any questions, feel free to contact me at yard.jose@students.uwlax.edu. As mentioned above, this project is small piece of a large collaboration of work by the students of Organismal Biology at the University of Wisconsin - La Crosse. To see more of the web pages created by other students please visit Multiple Organisms.